We woke at 7.30 so had plenty of time for a shower before breakfast – lucky for the other patrons huh? Breakky was as it always was – no complaints but nothing to rave on about either. Then we went back to our room for a while and watched not only the traffic at the lights but the filling of the car park below our window. At 7.30am it had been totally empty but here it is at 8.20, slowly filling up. 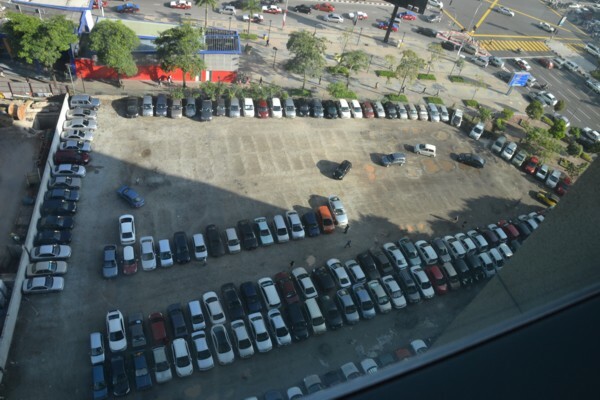 We loved the way you can see the outlines of where the cars park, considering the surface was just dusty – no concrete and certainly no painted lines! However, I’ve missed a bit. As the bus started moving away from the stop we’d got on at, and even before we’d paid our fare or got our headphones, guess what we saw on the left? 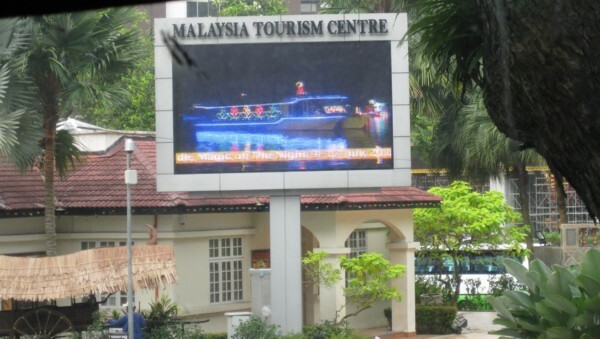 The Malaysian Tourism Information building. Do you remember back on page 2 when we caught the train for 5 stops and then walked to the back of beyond in the rain only to find the Tourist Info place flattened? Well here it was, maybe 300 – 400 metres from our hotel. We’d walked about 250 metres in this direction on our first day before turning down a side street towards the towers. 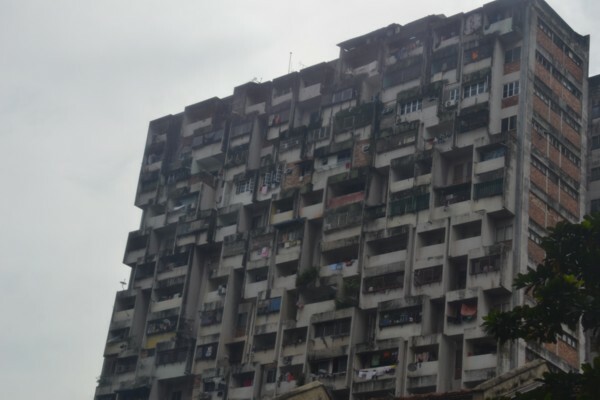 I don’t think I will type the words that went through my head when I saw this building. It would not be polite! Now I may as well tell you right from the start that some of the story about the HOHO will not be in order, but it will make for a less disjointed story so if you’re familiar with the layout of KL, and notice anything odd, just accept that you’ve been warned and I’m not making any claims to complete geographical or chronological accuracy. So back to where we were, David’s headphones didn’t work so he couldn’t hear the commentary that was supposed to be one of the highlights of the HOHO bus, so I just listened to the commentary through mine and repeated anything he’d want to know. Except he’s got this in-built sense… he’d sit there quietly until the moment the commentary started speaking and then he’d start up too. Every time, not just a few times. Silence… babble, babble, babble… from him and the recorded voice. And I only have one ear that works so I was trying to split it between the two of them. Luckily I’m not a bad lip-reader! 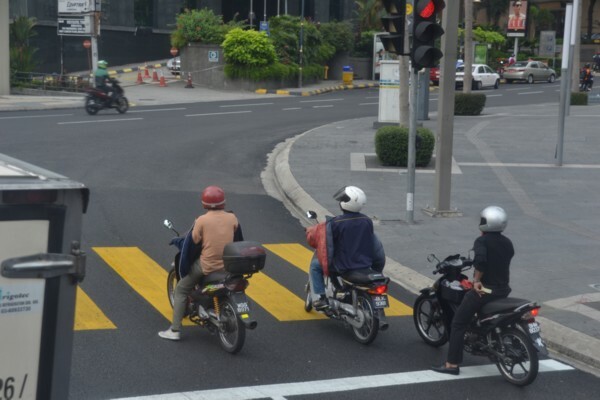 While I think of it, we had noticed many times as we walked around KL that the bike riders wore their jackets back to front. I guess it made them work really well when it rained but it still tickled us. We’d decided that we would stay on the bus for a whole circuit and then decide which stops we wanted to get off at during the second round but the route was circuitous and by the time we reached a rather spectacular fountain I made a snap decision that we would get off here. I don’t make snap decisions and it made David stutter rather in shock, but he’s a good husband so off we got. And do I have a good photo of these beautiful fountains that had excited me so much? Nope. Photographers are always talking about ‘light’ and this was one of those occasions where it was all wrong and a decent shot just could not be taken. This is one of David’s photos and definitely the best one we have. 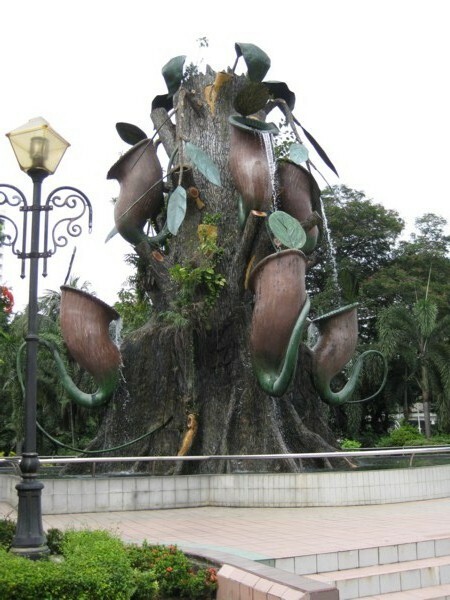 It was so statuesque and impressive and looked like a fly-trapping flower with the water falling from one to the next. It was beautiful!!! But never mind, you get a rough idea. 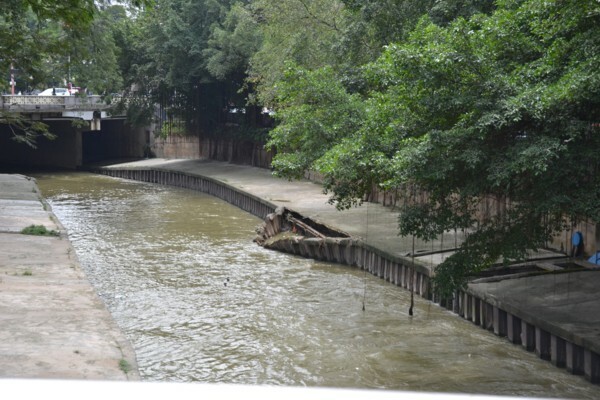 As we left we saw the ‘river’ which had always looked rather yellowy-grey and scungy, but in this instance it was bursting out of its bank retainers. It looked as if it had been this way for quite some time and I hated to think what the erosion was achieving under that footpath. Or indeed ‘Historic St Mary’s Church’ that was not far away behind it. We went back towards the bus stop and decided to find the signposted toilets which turned out to be down a short flight of stairs in an underground car park, but there was a fee and it was so exciting that if it was a pay toilet then it would be a quality facility. Well, despite my graduate degree in optimism, I shouldn’t have been so hopeful. They were fairly clean, I’ll give them that, but should have been part of a historic exhibition! The doors were of peeling paint. There had been no door between the man that took the money and the toilet ‘room’ – he was right there, about 2 feet away from the stalls. There was a dispenser of soap – or apparently so, because, as I held my hand under and pushed the plunger it was nothing but a sudden sharp spurt of water that shot out! That bottle hadn’t seen soap in the last 6 refills!!! And then there was the compulsory greenery. This time in a sawn off plastic apple juice bottle. It truly was sweet, I’m not knocking it, just making observations that made me smile in an ‘Aawwwww’ kind of a way. And I would be failing my duty if I did not tell you that as I turned the tap, it did just that – the entire thing swivelled around in its socket but did not turn on. I left, laughing, and had to explain the whole thing to David as I used the disinfecting hand-wash liquid from my handbag. There had been a hand-dryer in there. I didn’t try it but it probably blew soot! And here came the bus. We’d been on the black one, as featured in the video way back when, but this one was white. We behaved ourselves and got on using both feet (not hopping as the name ‘Hop On’ could suggest, and would be just like us to do) but the top deck was full (and they all glared ‘no room here!’) so we went over a stepped hump into the lower pit. I’d have called it a deck or a floor, but ‘pit’ it was. All of the sound jacks were either missing or hanging out with exposed wires and it was really short, cramped and hard to see out from down there! We were between the front and back wheels shown in the picture, and behind the painted people’s tummies. Not what we’d hoped for! As it happens I think the next stop was China Town and half the bus emptied so we shot upstairs and got decent seats so that was good. This time we did stay on the bus to complete the circuit so I’ll say a lot less but show you some of the sights we saw along the way. This was just beyond the China Town shopping strip. It truly looks to me as if half the building just slid away one day. I can’t fathom this one out at all. Is it an architectural feature, or did someone build a hut one day and someones have been building a room next door or an attic on top on a regular basis ever since? 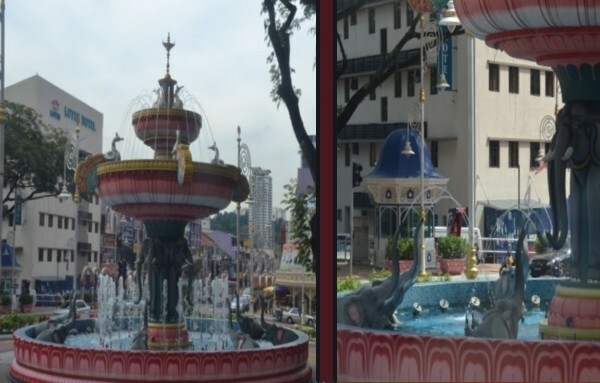 A fountain in Little India, taken from the bus. The first time we saw it, left, and the second time, right, with the elephants blowing water from their trunks. I will put some of the meanings in brackets because I only figured out a couple because of where they were. After some discussion we decided that we did not want to go to the National Museum but did fancy the Craft Complex – as long as this didn’t turn out to be somewhere we had to use our ‘no thank you’ skills. After some discussion of a different kind, we (ahem!) decided we did want to see the orchid and hibiscus gardens LOL And don’t you worry one bit, David gleaned a truck-load of sympathy over that from 3 friendly ladies on the HOHO. So here is the entrance to the Craft Complex, which I thought so pretty with its huge, obviously fake, flowers on a suspended hula hoop on each side of the pathway in. 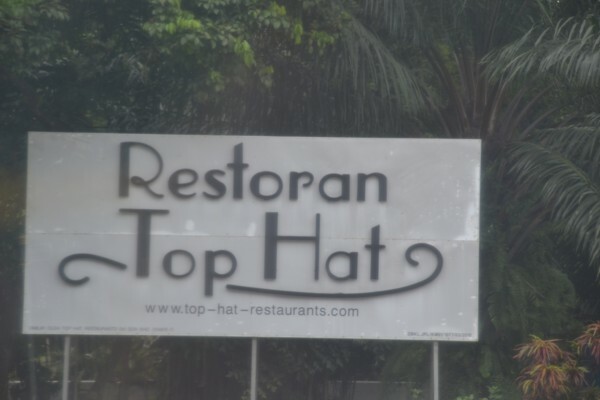 This place was interesting in that it was nothing like we’d expected! There were some displays, but mostly it was a large, meandering shop selling some lovely pewter, pictures and carved wooden items as well as some beautiful jewellery. The staff took no notice of us at all, and this was fine; in fact this was welcome! Out the back was a food hall which we looked through but everything was what I would call ‘native Asian’ foods and nothing at all tickled our fancy. We bought a bag of chips (crisps) each from an incredibly tiny stall right at the front where our only choice was chips, popcorn or a bar of chocolate. Back towards where we’d come in – because I can’t say ‘back towards the front can I? – was a large souvenir shop and we enjoyed a browse around here and bought gifts of 4 t.shirts and some little rose bud flowers embedded in plastic for all time. They’re much prettier than they sound. It’s so hard in these places when you live in Australia because we can’t even think of buying anything made of wood or cane or any kind of plant or animal material at all. They are all totally banned by our customs. You have to keep your wits about you during any shopping as it would be so disappointing to have to surrender the item as soon as we got home. We then had to wait about 20 minutes for the HOHO but we sat outside the Complex on a platform under a little roofed shade hut and ate our chips so we were quite content. 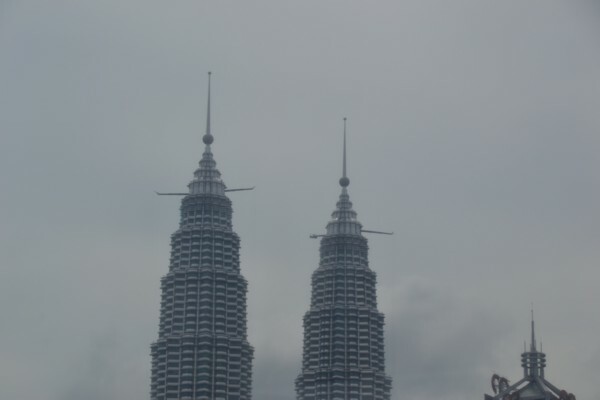 As we came into view of the Petronas Towers I noticed that they both had bits sticking out of the sides towards the top. We had not noticed those before – indeed they had not been there before – so we wondered if they perhaps supported the window cleaning contraption or something. Though why both towers would be out together I could not say! Fascinating anyway. 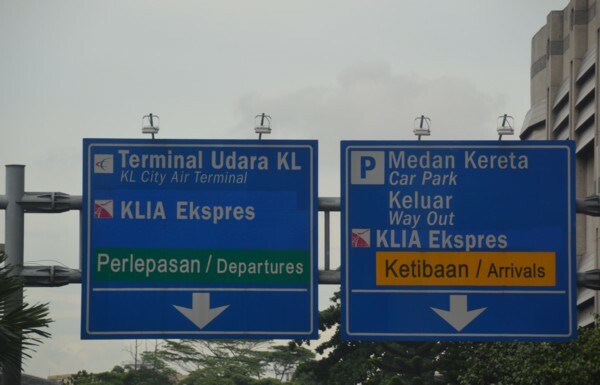 At one point in the trip we approached KL City Air Terminal and the recorded lady told me all about it, and the information was really interesting. Apparently it’s the only train station in the world with its own airport code and we could go there when we were ready to leave KL and check in our bags and then catch the train for the 20 minute journey to the airport if we wished. The bus continued around this building and the lady told me the exact same message once again. Then we took another corner and doubled back on ourselves, once more around this terminal and guess what? She told me AGAIN, in exactly the same words, about the train station. At last, thankfully, we went off somewhere else but, stone the crows, if about 4 minutes later we weren’t back circling this wretched building with the wretched recorded woman repeating herself yet again. Twice actually, because we seemed to have to circle the building clockwise as well as anti-clockwise to get out of its clutches. Six times I heard the spiel about how wonderful and unique this station/terminal was. I could recite it to you if you’d like? Enough already!!! Do the people that put these tapes together actually listen to them? 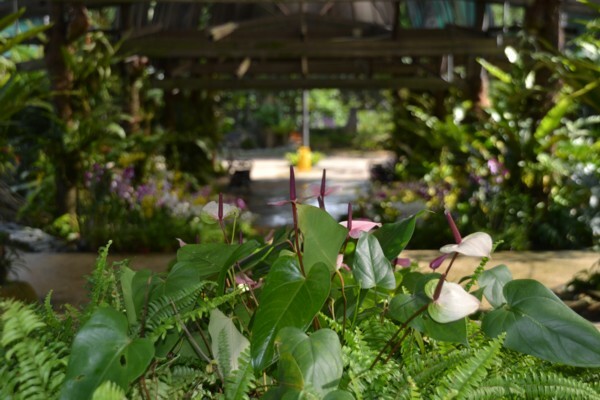 Finally we escaped the clutches of the vast magnetic bus-attracting field surrounding KL City Air Bloody Terminal and got to the Orchid and Hibiscus Garden stop. David gleaned further sympathy from his 3 adoring ladies as he dramatically dragged one leg behind him pathetically in mock protest as we aimed for the door. The orchid garden scored about 4/10 if you count the Singaporean version as 10/10. But we got a few nice photos. It really was hot up there on the top of the hill so we just dragged ourselves around rather, but there was nothing else to do and we were at peace amongst nature. I quite like this shot (below) – which is just as well because I had to wait ages for a woman who fancied herself no end to stop prancing around up and down the stairs trying to ‘accidentally’ get photographed. Sorry lady, I’m more stubborn than you are tee hee! We went down the sloping pathway towards the bus stop but hadn’t found the Hibiscus Garden and didn’t know if we had the energy if it involved coming back up the path again, but there was no one around to ask. Right at the bottom of the path were 2 guys hosing the pathway so I asked about the Hibiscus Garden. Their English wasn’t strong, but they were as friendly and kind as everyone we met in KL and had sufficient words to guide us. Yes, back up the steep path. This time we decided we’d brave the loos seeing as we were going to be here a while longer, though we dreaded to think! You only paid to come into the gardens on a weekend, and a tiny amount of money even then, so we were not optimistic and did not let our bladders in on the secret in case they got enthusiastic and then disappointed if we decided against the idea. We eventually found the loos tucked away in a little corner and there was an older man sitting behind a little open window to take our money. He must have the most boring job in the world, there were so few people around, but he was the sweetest person imaginable and after we’d given him our payment he gently and kindly pressed 4 neatly folded sheets of toilet paper into my hand. Funny how the smallest event can leave an impression of tenderness and compassion, but it did. 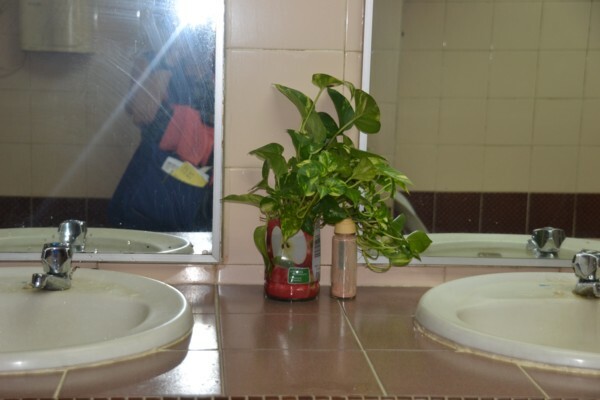 The facilities were even very clean, much to our surprise. 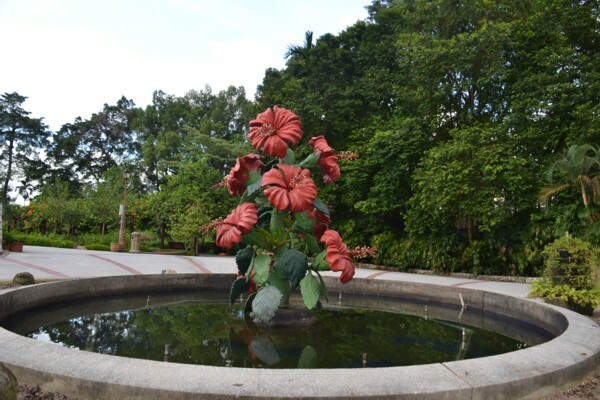 We now easily found the Hibiscus Garden, though it too was quite small, and what should have been an impressive fountain was just a dry statue. 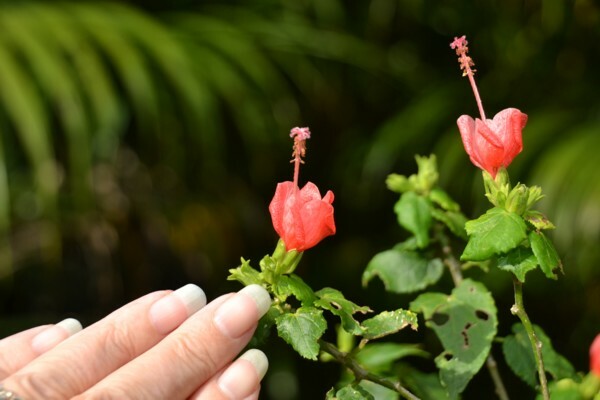 I was so taken with this tiny, tiny hibiscus. Isn’t it just gorgeous? The hibiscus in my garden at home are literally the size of dinner plates! I guess we waited about 20 minutes but ended up striking up a conversation with a South African couple after I’d tentatively spoken 4 slow careful words to the lady. I’d heard her speak to her husband and would have sworn she was speaking German but she’d been speaking English. Her accent was so strong to me! How embarrassing – whoops! 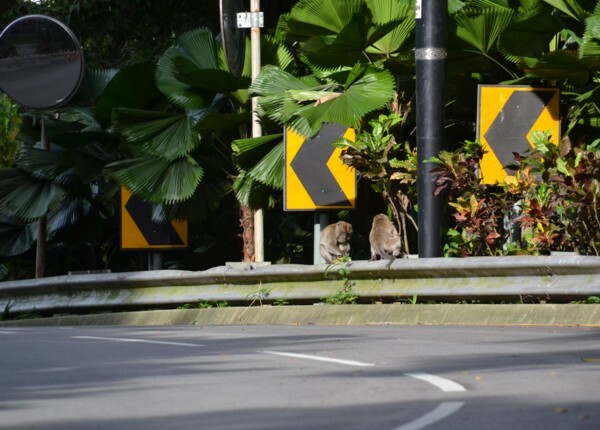 During our chat they told us that they’d been to the Batu Cave and been terrified of the monkeys there. They apparently just took a fancy to something that people were carrying and dove right in and took it. If you didn’t want to be scratched or bitten there wasn’t a thing you could do about it! Oh, I am sooo grateful we didn’t go. Imagine if one had wanted my beloved camera with all my holiday shots in it!!! And at that moment, as if on cue, David saw 2 monkeys just up the road. I’m happy to say they stayed there! The bus came soon afterwards and the rest of the journey back to the hotel was uneventful and not even much slower than the first time around – considering it was now about 5pm. Perhaps we only traversed the outskirts of the city. Now this photo isn’t the best example but it was all I could get. All of the vehicles we’d seen that I would call privately owned coaches seemed to be thoroughly decked out with these amazing curtains and pelmets! 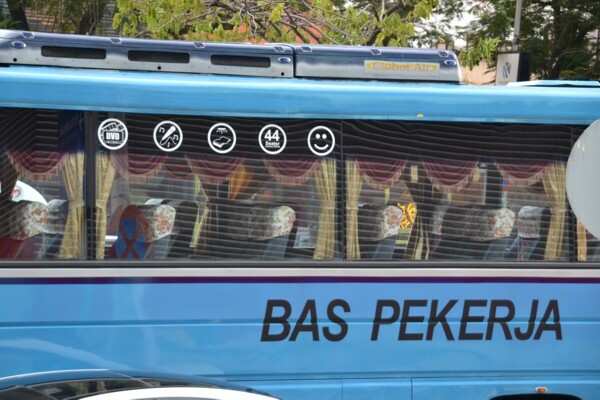 There was Bas Pekerja and Bas Persiaran and each coach had such richly coloured curtains! 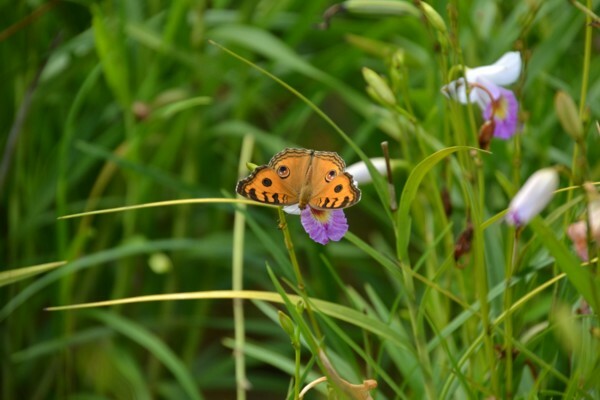 They appeared to be velvet, and all heavily adorned with matching or gold fringes. So amazing! Do that in Perth buses and some bright spark would probably bring scissors and turn them into a chain of dolls, or set fire to them! 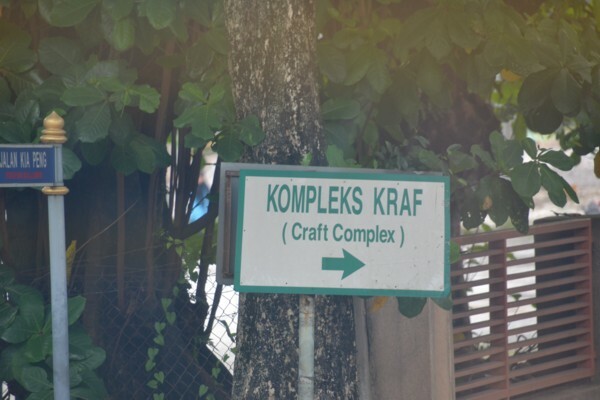 Anyway, we now went up to our room to unload David’s backpack, and then popped across the road to Ampang Park because I’d seen a butterfly dress in one of the shops there selling for 18 Ringits, not 39 Ringits as they had been asking in the Butterfly Park shop! I rarely buy clothes unless we go on holidays and after choosing a blue butterfly dress, David chose a black one for me as well. Still cheaper than only 1 dress at the Butterfly Park. For dinner we still avoided the G-Tower Club. That awful smell for 2 nights in a row had left a strong impression! We decided that if the House restaurant downstairs was very nice then the one in the foyer of the hotel would be nice too. They shared the same kitchen and chef. Tonight we were not served by Tin Tin or Lala but Nana. Yes, that amused us too. I guess David or I could never get a job there. Well, unfortunately, we had quite a wait for our meals to come and David’s arrived so very long before mine that he only had a couple of mouthfuls of his tiny salmon and vegetable dish to go when mine did get delivered. My chips (the hot kind)… well, I’d be polite if I described them as luke warm. The focaccia mushroom burger was very nice though. When I finished this, David managed to trip a waitress over (verbally) and ask for a dessert menu. We were laughing for quite some time saying they probably wouldn’t come back to take our dessert order and were almost right! In the end David had to attract their attention again. I wanted tiramisu but they’d ‘forgotten to order it’ so I decided on a brownie instead. I forget what David ordered but they then brought out cutlery only for me. We shrugged. My brownie arrived and I’d almost finished it before they brought David’s dessert out. And then they noticed they hadn’t given him any cutlery. Sigh! Probably just as well this was our last night here, we were running out of places to eat at. We went back to our room for a cup of tea that would be ordered and delivered in a timely manner – by us – and went to bed at 9.45. Going Home Day and David, predictably, woke at 5.15. I’m not quite so crazy and woke at 8am. We had a very leisurely shower and for once stuck to our resolve to have breakfast before packing. It was odd at breakfast, we’ve usually struck up friendships with staff long before now but we didn’t even tell anyone it was our last day or say goodbye. There were pancakes on the menu today though so that was nice. Yummo! Then we packed our cases and still had plenty of time so went over to Ampang Park to try to buy one last gift but couldn’t find anything suitable. Fortunately we did find just the perfect thing in the clothing stalls in the underpass on the way back though. Now I’ve forgotten to mention the traffic light walk signs. In Perth we have a red man when you’re not allowed to cross and a green man when you can. In KL the green man’s legs move and as time is running out his legs start to move faster until, just before it changes to the red, he’s running like billyo! I was laughing out loud standing there on the footpath when I’d noticed this. And David didn’t notice so he was looking at me as oddly as everyone else ha ha! This now took us to hotel check out time. As we paid, we asked reception if they could get us a taxi to the airport but decided we’d get one of their limousines instead of risking Speedy Gonzales again. The limo was reasonably priced and we were able to add it on to the hotel bill rather than needing cash once we reached the airport. This left us a few Ringits for something to eat so that was good. The driver was lovely and chatted to us and gave us information about all the suburbs we were passing, including rough prices on the houses as we got further away from KL. He told us that if we stayed on this highway it would take us all the way to Singapore but there were 100 toll booths to go through before you would get there. ‘Wow’ is not a strong enough word! As we went through one of the four tolls to get to the airport I counted that this one was 22 bays wide. There were no road lines leading to or from these, it was just a free-for-all to arrange themselves again for the 3-lane highway beyond. We got to the airport without fearing for our lives and managed to find where to check in. It was a massive place and we had to find counter row M on the absolute far end and then there was facility for about 20 check-in counters just in M alone. I needn’t tell you they only had 3 open and working, and our guy started to make a fuss that David was carrying 2 cabin bags until David laughed, pointed at me standing right next to him and said “One of them’s hers!! !” If only everyone had his manner – to laugh about things that others would get angry over, and to laugh in such a way as to not upset either party. Then we did all the usual passports, scanning, exit procedures and catching the train again before more scanning and emptying of our water bottles. There really wasn’t much of a wait after this so we made the ‘compulsory trip’ and of course I photographed the sign in there that made me laugh no end. 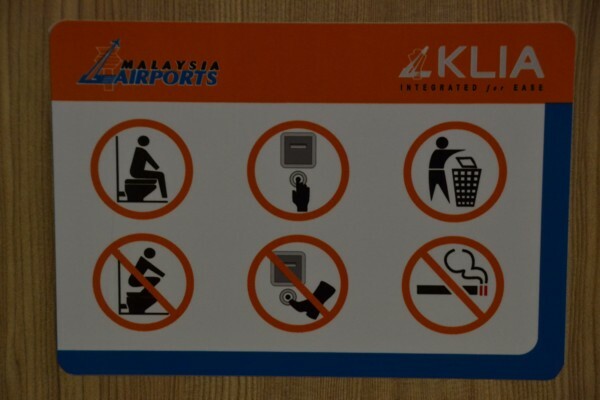 Yes that’s right – don’t stand on the seat and *definitely* don’t kick the flush button. You’d have to be into kung fu to get your foot up there!!! The ‘flight’ to Singapore honestly took way longer in loading and taxiing than flying. 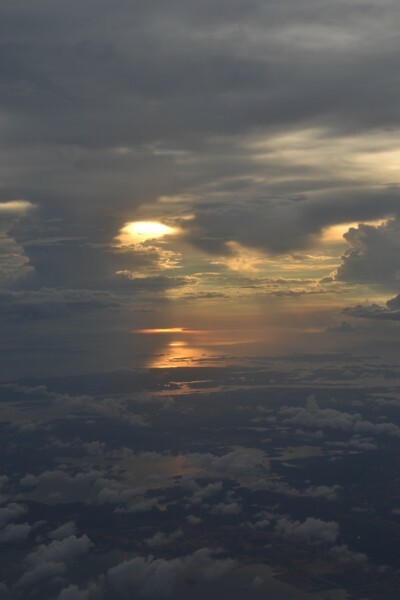 No need for in-flight service because there wasn’t time and before we knew it we were landing again. In fact we’re not quite sure we did land. It was the gentlest touch-down we have ever experienced because we felt nothing at all, only the braking. Once in Changi Airport we noticed an amusing sight that had been there as we’d come through a week ago. There’s a large concrete pillar in the middle of a very wide walkway and around it were 4 stainless steel posts holding bunting flags and a big sign on 2 sides saying ‘Out Of Order’. How can a concrete pillar be out of order? 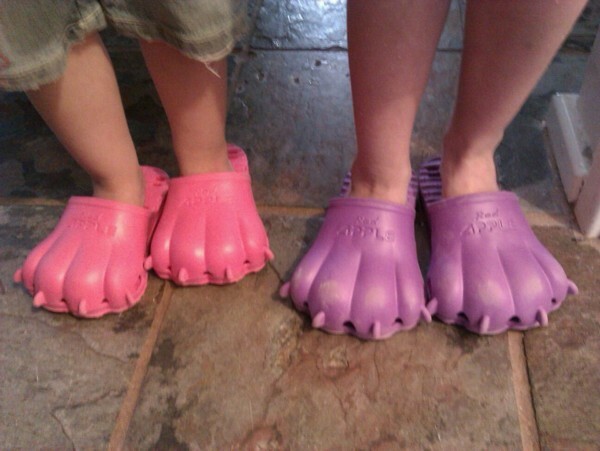 And a picture of the monster shoes in use once we’d arrived home. So until the next holiday – thank you for reading!!! All of my photos are available as greeting cards, posters or fine art prints through RedBubble. If you’d like a particular shot added for sale just leave a message below. Came across your blog by accident and since then I’ve read all your holiday reports and enjoyed them all. I like the way you and David are always optimistic and make the best of it, even on days when the weather or places don’t quite measure up. Next is Phuket in late June – you’re the first to know 🙂 🙂 🙂 Thanks again!!! she is fine and well walking around like theres no difference! potting around in her beloved garden! lol! and thankfully no repairs needed for the camera 🙂 next time i go im hoping to do as much sight seeing as possible and this time dragging my brother along with me as he couldnt come along last time due to being busy with his A-levels.. i love travelling and its good to see people sharing their experience and just generally being kind as you are 🙂 the world needs more people like you honestly! lol! aww! thank you!! yes he does enjoy sightseeing as much as i do! hes a much better photographer too in fact! hiii! its Asiyath/Aisha from DA! just letting you know that i stopped by to read about your visit and i must say it was a highly interesting read! i love the pictures in here and recognise some of the hilarious things i experienced as well (the no standing on the toilet seat- why anyone would do that is beyond me!) unfortunately i did not get the opportunity to do as much sightseeing as you as the main reason i was there was accompanying my father and grandmother while she came for a check-up about the knee surgery she had done in KL.. and my camera broke on the very first day i was there, only to realise when i got back to Seychelles that the lens was just stuck and now my camera works fine =.= but im looking forward to going again soon!! for letting us read and view the photos, what a wonderful and beautiful place. Take care you to. 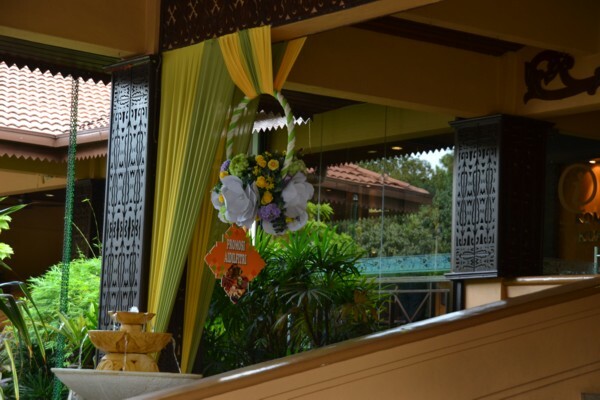 Thank you so much for commenting and for reading – it’s great to know that you could take a virtual holiday to KL from the comfort of home 🙂 Happy Christmas and all the best for 2012 to you both also. And the girls. Heaps of hugs!!! Lovely story and I quite enjoyed it but one thing, you haven’t made me feel as though I am missing out sounds like even you did not exactly enjoy yourselves. Thanks for commenting Pat. Well, I think you’re right; I have not made you feel that you’re missing out because that’s the way I feel. We enjoyed going there, we enjoyed exploring around the things we saw, but there were a lot of things we expected that were not to be. Definitely the Fountains to Music being no more was a big disappointment – and even more so because everyone looked at us as if we were mad when we asked about it. ‘Hey guys, I can prove it – look on YouTube!! !’ The sky bridge between the towers is usually open for people to go up, but that was shut for Nov and Dec. The firefly cruise was far away and we couldn’t find a tour to take us. When we asked the G Tower Hotel about tourist attractions they did not even tell us that the Tourism Info place was only about 500 metres down the road. Lots of small disappointments and a whole heap of missing information. Shopping was great and we felt perfectly welcomed and safe. Walking the streets was dangerous – purely and solely because of the drains. I’ll stop raving on, but that’s pretty much the summary I guess.